Commencement is the central event in EVMS’ academic calendar. 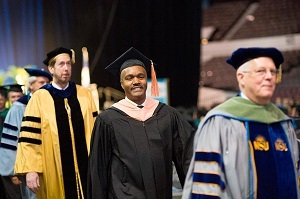 Faculty play an important role in the success of Commencement and their attendance is meaningful to our graduates. All full-time, part-time faculty, as well as Associate and Assistant Deans, are encouraged to participate in EVMS’ Commencement. Community faculty are also invited to participate. EVMS will provide regalia for all faculty participants who do not have their own regalia. RSVPs are required to ensure we have regalia and the proper number of seats in the arena. All faculty should RSVP and order their regalia here! If you have your own regalia, you must still RSVP to attend the Commencement Ceremony. All faculty RSVPs and regalia orders must be placed on the online form by Friday, March 22, 2019. Please email Julie Seals in EVMS Special Events or call 757.446.6189 with any questions or participant substitutions.